Well, technically what happened here is that Community was given a fourth-season pickup from NBC. But since it’s Community we’re talking about — a show that feels like it’s been staving off death (while making meta jokes about it) since it premiered — framing it as a survivalist kind of thing seems to make sense. But yes, feel free to be positive and happy here: NBC’s odd creature of a sitcom will return next year, albeit for a shortened 13-episode run. However, that doesn’t mean, as had been rumored, that next season will be Community‘s last. 30 Rock, which also got a 13-episode pickup, will be saying good-bye after next season, its seventh. But, believe it or not — after the whole “getting suspiciously yanked off the schedule mid-season” thing and the whole “having its creator and a primary cast member feuding in public” and the whole “being inscrutable to most normal people” thing — Community will continue to live on, indefinitely. 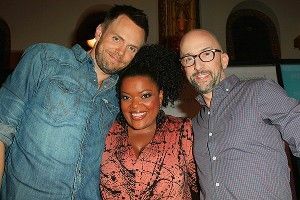 As Yvette Nicole Brown tweeted, “Who cares how many eps we got. Just rejoice in the pick-up, PLEASE! It wasn’t guaranteed. It’s a blessing! Thanks.” Damn straight.